Also you can buy my latest remixes from Beatport. The second half is a section of my DJ set taken from This Is Techno. You can download the full set from soundcloud. METRO BOY on the SHOWCASE. Presented by DVNT. Up this week one of the shows earliest and loyal listeners and an ever growing force in electronic music. Perhaps better known as being one half of festival breakbeat mega raver favourites Ben & Lex; I’m very happy to present: Metroboy. Metroboy aka Ben Ervine is a producer/DJ from the southwest of England, and forms one half of award-winning breakbeat duo Ben and Lex. Metroboy’s music is a crunchy, hard-bleep style of minimal and tech house, with unflinching grooves and uplifting tones sure to lock in any dancefloor. His remix of Benjamin Vial’s “The Bass and the Monkey” was released on Plasma.Digital in Feb 2009. Further remixes for Ape and VIM records are in the pipeline. 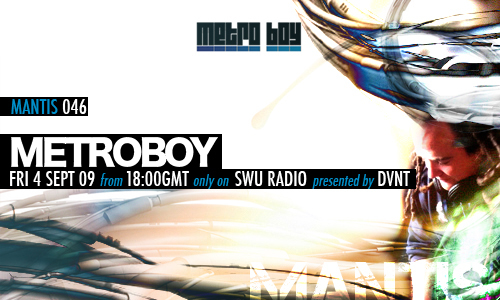 Since Sept 2007 MetroBoy has hosted a bi-monthly tech house, minimal and techno show on Brap.FM featuring the latest sounds from Minus, Get Physical and Berlin as well as many other quality modern tech producers. A full archive of the show in podcast format is available on the MetroBoy blog – Well worth exploring for some awesome mixage from tech jazz and deep house to crunchy techno. Archive, podcast and tracklistings available for all the previous shows can be found here. Alternatively you can subscribe to the podcast, using either iTUNES or the RSS feed. Finally sorted out a full resolution video for my remix of Smacs and Patrick Kong's 'Paraffin' forthcoming on the VIM Records. DJ set recorded at This Is Techno @ The Plug n Play Studios, Reading. Usual business with yours truly, DVNT, selecting the first hour of sound presenting my current crop of darkfloor electronica. To those who entered the vinyl giveaway on the last show, the vinyl will be going out soon just waiting on the vinyl mailers. MANTIS is syndicated live to The Drome within Second Life. If you are a Second Life user, please head here for more info or teleport.